A contemporary, spacious 2 bed villa with a large private infinity pool. Located on a beautiful peninsula 30 minutes drive from St. John’s. The Peninsula is home to a small select number of luxurious homes on the waterfront. 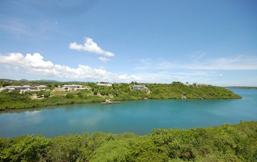 Watch turtles & pelicans, enjoy breathtaking views, privacy & tranquility in an unspoiled environment. This villa is for those who enjoy peace and tranquility. The stunning waterfront location at the Peninsula along with the contemporary style is what sets this holiday home apart from others. The villa looks out from the Peninsula, towards Pelican Island and the reef beyond. 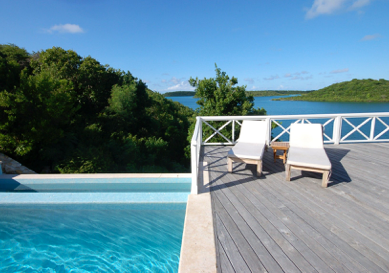 A large infinity pool enables you to swim whilst enjoying the views in the distance. There are large areas of deck on either side of the villa, with ample room for sun-bathing. Cooling tropical breezes enable you to enjoy the tropical sunshine in comfort, even on the hottest days.